Dental Cleanings (Prophylaxis) – A process that involves the removal of “dental plaque”, dental calculus” calculus, and stains from the exposed surfaces of the teeth by polishing as a preventive measure for the control of the oral cavity. Gum Disease is also known as periodontal disease. It affects the teeth when plaque, caused by bacteria, collects around the neck of your teeth due to bad oral hygiene. This causes the gums to become red and inflamed. Gingivitis is the mildest form of the disease which causes the gums to redden, swell, bleed easily, and cause discomfort. Gingivitis is reversible if properly treated and good oral health care is administered at home. Untreated gingivitis can advance to periodontitis. Over time, plaque can grow and spread below the gum line. Toxins produced by the bacteria in plaque irritate the gums and causes an inflammatory response in which the bone that support the teeth is broken down and destroyed by the bacteria. The gums will begin to separate from the teeth, forming pockets, and become infected. As the disease progresses, the pockets deepen and more gum tissue and bone are destroyed. Often, this destructive process has very mild symptoms, and eventually teeth can become loose and may have to be removed. Scaling and root planing is the most common and conservative form of treatment for periodontal (gum) disease. Scaling is the removal of calculus and plaque that attaches to many surfaces of the tooth. A dull metal tip that vibrates at a very high frequency is used to “knock” plaque and calculus off of the tooth. A water irrigation system is attached and cools the tip to help flush out debris from around the teeth. The process especially targets the area below the gum line and along the root where plaque is more likely to stick to rough surfaces. For this reason, the root surface is smoothed down in a process called root planing. Root planing removes any remaining calculus and smoothes irregular areas of the root surface, thus slowing down the progression of bone destruction. The preservation of bone is what allows us to keep our teeth our whole lives. X-rays will be taken during your appointment to ensure that you do not have any tooth decay. At our office, we use digital x-rays, which equal less radiation. The equipment used in digital radiography exposes dental patients to much less radiation. In fact, digital X-rays use up to 90 percent less radiation than traditional film X-rays. While conventional dental X-rays are relatively safe, digital radiography is an excellent option for those who take X-rays on a regular basis or for those who are concerned about radiation. N20(Nitrous Oxide) – Often called laughing gas , nitrous oxide is a common form of sedation that produces a euphoric (great feeling of well-being) effect. You will experience a light, airy feeling with the Nitrous and return back to normal when given Oxygen. Nitrous oxide may be provided during dental procedures to relieve dental anxiety in both children and adults. Nitrous oxide is combined with oxygen in order to produce a calming effect while patients remain conscious. It is so gentle that patients can resume normal activities and drive themselves home following dental treatments. Nitrous oxide is mainly used in conjunction with a local dental anesthesia, which is still necessary to numb your mouth during dental surgery. If you are avoiding the dentist out of fear, nitrous oxide can help you get the dental work you need. If interested feel free to ask us so we may further explain and answer any questions that you may have about nitrous oxide. Dental Bonding – dental bonding is one of the easiest, fastest and most affordable cosmetic dental treatment available. There are some exceptions to this procedure and can be discussed at the time of your appointment. During a dental bonding procedure, the dentist will apply a tooth-colored resin to your tooth. A special light is used to harden or “bond” the material. It is a simple procedure that will help improve the appearance of your smile. Dental Implants– are the most logical choice in replacing a missing tooth but also the most expensive. 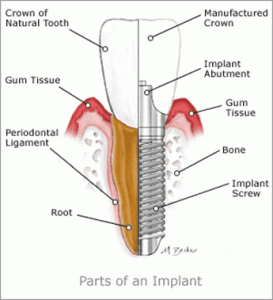 Dental implants are surgically placed into the jawbone and a crown sits on top of the implant. Dental implants can also be used to anchor a dental bridge or lock dentures into place. If you need to have all of your teeth extracted, implant-supported dentures are ideal for providing more stability than traditional dentures. Dental Bridge-A dental bridge is a logical second option to an implant in replacing a missing tooth. The pontic, or missing tooth, is permanently placed between the healthy teeth on either side of the missing tooth. Once the bridge is cemented, it cannot move. Good oral hygiene is crucial because bacteria can sneak under the crown if not properly cared for. Wisdom Teeth-When third molars, or wisdom teeth, come in sideways, or are too large, this may cause discomfort and may ruin the cosmetic appearance of your smile. A Broken Tooth as well as teeth that have a significant amount of tooth decay that cannot be treated by a root canal will need an extraction. Patients with advanced gum disease may be considered for an extraction due to the damage caused by the bacteria from gum disease. Root Canals-A root canal procedure is needed when a dental cavity or dental infection reaches the pulp chamber or nerve of the tooth. The infection destroys the nerve located within the root of the tooth, eventually causing the tooth to die. During the procedure, local anesthesia will be administered to you so that you remain comfortable throughout the root canal. 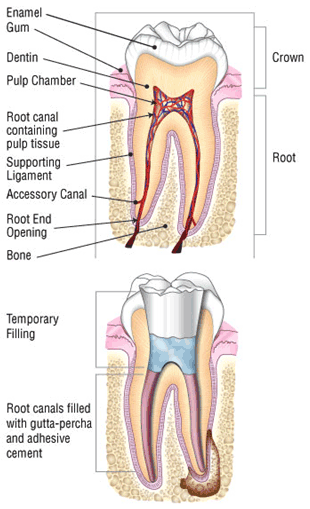 A small opening will be made through the tooth’s crown to remove the infected pulp and nerves located within the root. Like dental fillings, the area will be cleaned and the root is filled to keep the infection from returning. 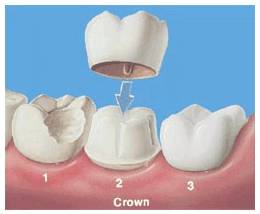 A dental crown should be placed over the tooth to further protect it. You may experience some sensitivity for a few days as the tooth heals. This is because the medicine used to kill the infection may be irritating the bone around the root of the tooth. The relief you will feel in the end will make the treatment well worth it! Teeth whitening has become a fairly easier procedure over the years. You may do the in office whitening procedure or you may choose to have custom fit trays made that you whiten at your own pace at home. Both are very effective and worth getting that bright white smile that you will love! Dental Veneers-are thin, porcelain covers that are attached to your existing teeth to meet a variety of cosmetic goals. Veneers can be matched to your natural or desired tooth color for a uniform, authentic appearance. Dental veneers are also highly stain-resistant and may actually strengthen your natural teeth. Dentures-Missing teeth can affect your ability to chew, eat and speak properly, so it is understandable why you would consider dentures. Today’s dentures are made of composite resin and porcelain, and they are designed with a “precision fit” to ensure comfort. Dentures are a solution of last resort. Many people assume that they will need dentures as they age, but losing teeth is not a normal part of the aging process. Although dentures may look like your natural teeth, they do not work as well. Simple actions like speaking and eating may feel different. You will have to learn how to adjust to your dentures, which for some people can take several months. 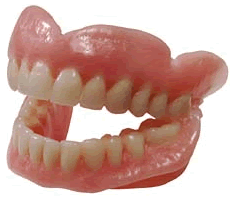 Dentures or complete dentures are made for people who have lost all of their teeth. 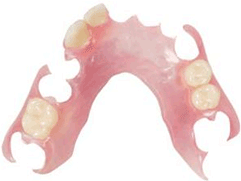 Complete dentures can also be given additional support by placement of implants in the bone under the denture. There are also other types of dentures; a partial denture is an appliance that you put in and out of your mouth just like a complete denture except you may still have some of your own natural teeth remaining.